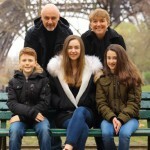 Didier, Donna, and their three children currently serve in France with Cru Ministries, bringing the gospel to creative communities through visual arts. Their vision is to provide discipleship to young artists and encouragement to the Christian community in Paris. Please pray for increased influence for the Heslon family, that they would be able to bring the love of Christ and spiritual breakthrough to their region!